Hamburgs lay four small, white, flavor-packed eggs a week. What they lack in egg size, they make up in longevity. Hamburgs consistently lay for many years. 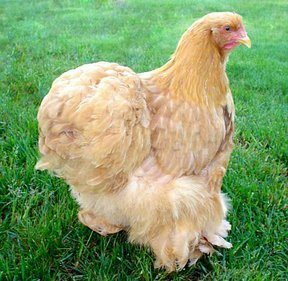 In fact, the Dutch called them “everlayers.” Hamburg hens mature early and start laying at four months of age. The chicks have a delicate constitution, but once established, the breed proves quite robust. Hamburgs like to forage and will fly the coop to do so. Fortunately, they tolerate cold and can endure a night away from the coop. An active breed they often refuse to sit long enough to hatch their brood. Hamburgs have a wild disposition. They like to fly, forage, and roost in trees. Owners have awaken to find their whole flock in the trees. Humans easily spook the Hamburg chicken. Given these traits, the breed has little toleration for confinement. They enjoy free-range freedom and free-range food in the form of grain. Hand raised Hamburgs will tolerate humans more than those left to grow up on their own. Like most foragers that survive, Hamburgs develop a keen awareness of their environment. The Hamburg parades for the world ten different plumages: Silver-Spangled, Golden-Spangled, Golden-Penciled, Silver-Penciled, White, Black and Citron Spangled. 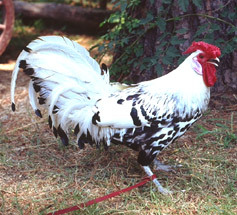 Although small to start with, the Hamburg breed has both a standard and bantam size. The standards average four to five pounds while the bantams top out at one and half. Hamburgs sport red rose combs, medium matching wattles, and white earlobes. Their unique horn colored beak has gray shanks. Unlike most chickens Hamburgs wear pink soles on the bottom of their feet. Butchered Hamburgs display a white meat on dark colored bones. Build a run with high fences or even a wire cover to keep Hamburgs in the run. Otherwise, clip their wings to curb their innate flying behavior. They like to forage. Give them plenty of room. Flighty to the extreme, Hamburgs often refuse to sit on their eggs. 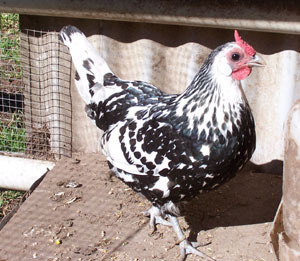 Provide your Hamburgs with a hen from a broody breed to hatch their eggs. Many Hamburg owners use Brahmas for that purpose. Pay special attention to new chicks as Hamburg young have a high mortality rate. After the first four months, they usually fend for themselves. Many of the breeds historians trace their heritage to Hamburg Germany or Holland prior to 1700. 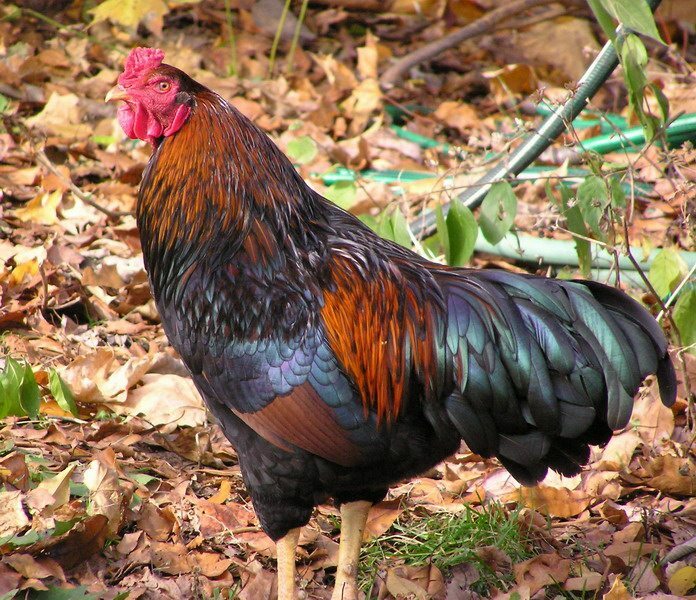 In Holland the breed had many names: Pheasant fowl, Pheasants, Yorkshire Pheasant, Silver Pheasant-fowl of Yorkshire. One well noted expert on the breed cites 14th century Turkey as the origins of the breed. The Hamburg chicken has a literary connection to L. Frank Baum the author of the Oz books including the famous Wizard of Oz. All six of the Hamburg strain earned induction into the American Poultry Association’s Standard of Perfection in 1874. 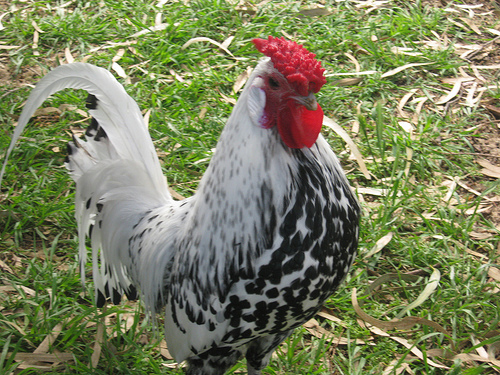 The size of the fowl, their contentious temperament, and their dark bones worked against the breed’s popularity in America. Today fewer than a 1000 fowl live in the US.